I would like to introduce guest blogger Hanan Kavitz of Applied Materials. 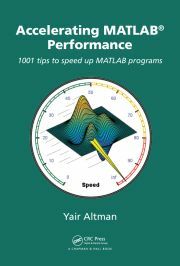 Today Hanan will discuss several quirks that they have encountered with compiled Matlab DLLs. I work for Applied Materials Israel (PDC) in the algorithm development department. My group provides Matlab software solutions across all of our products. I am a big fan of Yair’s blog and was happy to receive an invitation to be a guest blogger. In PDC we are using Matlab compiler and Java Builder to deploy our algorithmic products at the customer sites. The software we produce includes binaries of three sorts: exe, C++ dlls, and jar files, all compiled using Matlab deployment tools. Each file was about 43MB in size, and combined they consumed the entire free space in the hard-disk, preventing applications from lunching. 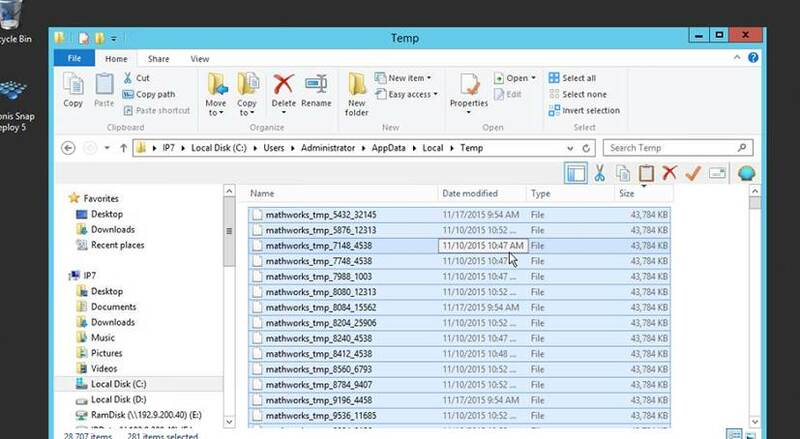 At first I looked in our code for the code that will produce files with this naming convention and once I was sure there is no such code I was comfortable to assume that they are MathWorks internal-use files (indeed – who other than MathWorkers would call their files mathworks_tmp_…). Compiling and running a small ‘hello world’ C++ dll showed that every time that a Matlab-compiled C++ dll executed and ran, a temp file is created and then deleted in the %tmp% dir (tempdir). If the process that runs this dll is ‘killed’ during the run, the temp file is not deleted and remains in the %tmp% folder, accumulating over time until the hard disk becomes completely full. All had a naming convention mathworks_tmp_XXX__YYY, whatever the extension of the file may be. They are all useless when the Matlab application is done running. When lunching the process that runs Matlab compiled dll, change the %tmp% directory to a new one. Delete this directory once done running or on the next process start. As a separate discussion, our compiled algorithm is embarrassingly parallel in nature so our C++ team is running it in parallel processes across several machines and many cores. As with all Matlab-compiled C++ DLLs, it needs to be initialized with a call to mclInitializeApplication per running process. This worked well when we had a relatively small number of processes running concurrently but lately we encountered a problem that out of dozens of calls to this function from time to time a call is stuck (not failed – exactly that: stuck) and the process needs to be killed. We don’t know why this happens and the solution we are currently using is pretty “shaky” at best – we retry the call to this function several times until it eventually works (and it does work after several tries). I have a suspicion that something is not entirely parallel with this function and there exists some hidden internal shared resource among different processes but no way to know exactly as this is an internal MathWorks function. This is relatively old issue we encountered at the beginning when we just started using Matlab-compiled DLLs, so this might not surprise some readers. While Matlab’s builtin (automatic) multithreading is great when used in the MATLAB IDE (non-compiled), it creates a problem when running compiled DLLs in parallel across multiple processes: this multithreading ‘starves’ for cores because they are busy at running other processes. The solution is simple and well documented – when calling mclInitializeApplication before launching the DLL, pass it the singleCompThread flag to prevent implicit multithreading. We found this single threaded DLL to run faster because it reduced CPU ‘starvation’ drastically in a multi process environment. Happy New Year of the Monkey everybody!